The Door County Half Marathon & Nicolet Bay 5K will be run on May 5th, 2018 on an USATF-certified road course closed to all traffic through the beauty of Peninsula State Park with scenic overlooks and historical markers. Registration closes April 28th! 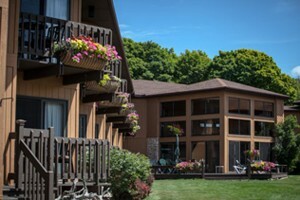 Whether you’re running, watching, or just enjoying Spring in Door County, there are some great rooms to be booked and some Half-Marathon Lodging Specials too. Don’t go hungry! The Cookery Restaurant & Wine Bar invites runners to carb-up for energy with their tasty Pasta Specials on Friday evening, May 4th! 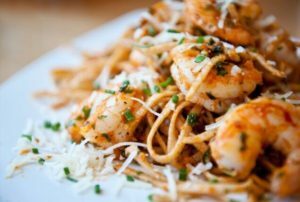 Pasta features will include Whole Wheat Linguine with Wild Shrimp, Vegetarian Linguine, and Roasted Tomato Orecchiette. View a full description on the here. After the race on Saturday, head back to The Cookery for Live Music with Deathfolk from 3:30-5:30pm. This local duo recently finished their first album featuring the songs and sounds of Jess Holland and Nick Hoover in a mix of old-timey, folk music peppered with tight harmonies. 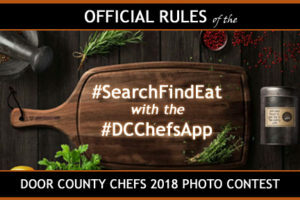 Find ALL of Door County’s restaurants and more with click-to-call phone number and GPS directions, and check out upcoming events in Door County with Door County Chefs FREE Mobile Dining App! 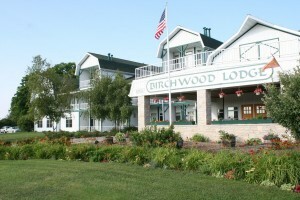 BIRCHWOOD LODGE in Sister Bay is located within walking distance of shops, restaurants, bars, recreation, a grocery store and the beach/marina/waterfront park in Sister Bay! We have a 2-night minimum this weekend with Premier Suites and Village Homes available, but do have a few Premium Suites available for 1-night stays on Friday or Saturday as well. Door County Half Marathon (Valid weekend of May 5, 2018): Be our guest during your Door County Half Marathon event. You will receive 10% off your room rate for your stay in a Premier Suite with a king size bed, whirlpool tub, gas fireplace, kitchenette, full bathroom and private deck/balcony. Light continental breakfast is included. Take a shuttle from our lodge to and from the course at no charge. After your run, soak in your in-room whirlpool tub or take advantage of our sauna in the pool area. If you finish in first in the men’s or women’s division, your stay will be on us. If you finish second or third in the men’s or women’s division your stay will be 50% off. In order to receive the special pricing, it must be mentioned when making the reservation. Call for details and availability, some restrictions may apply. PARKWOOD LODGE in Fish Creek features a variety of affordable room types including our newly remodeled Deluxe Lodge rooms, Deluxe Kitchenettes (all with 2 Queen beds) and new Family Suites (sleeps up to 7). The resort also has King rooms and 1 Bedroom suites with wood burning stoves. All of our rooms and suites are equipped with private bathroom, air conditioning, refrigerator, microwave, phone, and cable television and free wi-fi. Several rooms are still available this weekend for 1 and 2 night stays. Door County Half Marathon and Nicolet Bay 5K (Valid May 4-6, 2018): Stay at Parkwood Lodge Fri & Sat for two nights and receive a special package price. Plan your stay with us soon, we are filling up quickly. Remodeled King Rooms and Kitchenettes at $178 + tax for two nights. 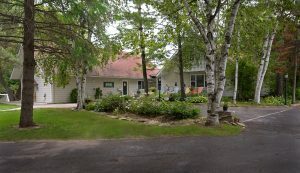 PINE GROVE RESORT is located in Ephraim and offers a piece of natural, pristine shoreline, and private sand beach, as well as luxury suites with private whirlpool baths, a heated indoor pool, whirlpool, and pool sundeck, overlooking Eagle Harbor. Rooms are available this weekend; prices vary based on Water view, Partial water view, or Wood view. 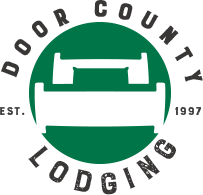 Door County Half Marathon Special (Valid May 4-6, 2017): As a lodging sponsor of the Door County Half Marathon, we are offering all runners and their guests a 10% discount off our 2018 rates during the Half Marathon weekend (May 4 -6, 2018), when booking a minimum two night stay. 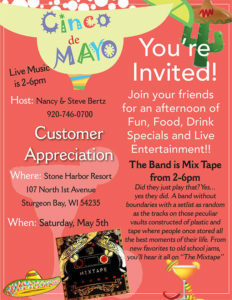 Along with this discounted rate we will include a special gift bag and free shuttle service to and from our resort to the event. In addition, if any runner staying with us finishes in first place in the overall men’s or women’s division, your stay will be FREE! If any runner staying with us finishes second or third in the men’s or women’s division, we will give you 50% off your stay. Please mention this offer when making your reservation. This offer cannot be given in conjunction with any other discounts. Check out all of our Lodging Blogs and follow DC Lodging on Facebook to hear about lodging specials, available rooms, and last minute cancellations first!